If you're looking for Pickathon meets Paradiso—the community-oriented, wilderness-encircled camping experience combined with some of today's most ground-breaking electronic musicians—then this summer's inaugural What the Festival is your dream ticket. Located two hours from Portland, nestled just outside the Mt. Hood National Forest in the scenic White River Canyon, WTF?! is shaping up to be a veritable amalgamation of the electro-offerings at Coachella, Electric Daisy Festival, Burning Man, and Sasquatch. Between the art tent, splash pool, hookah lounge, yoga deck, and a variety of local food vendors and artisans, this festival will be an eclectic junction of things to see and do. Three full days of camping, exploring, raging, and finding time for sleep and peace already sounds wonderfully daunting with the knowledge that you'll want to be in a million different places at any given time. Beats Antique already showcased their belly dancin', livetronica steampunk on the stage at Sasquatch this past May as well as the sands of Black Rock City and Eugene's McDonald Theatre in the last 12 months. And we're sure they'll be happy to be back in Oregon forests this summer for a night-one headlining set that takes "so-called inhuman sounds and give[s] them dynamics and human expression,” according to BA drummer Tommy Cappel. If your camp is set up by 5:30pm and you're just hanging out, you should be doing so with PDX mainstay DJ Tyler Tastemaker. Saturday also features the Diplo- and Skrillex-approved moombahton artist Dillon Francis making bouncy electro and dubstep-flavored beats for moving those feets. A tight collaboration between classically trained saxophonist/producer Dominic Lalli (he's got a master’s degree in jazz from the Manhattan School of Music!) and drummer Jeremy Salken, Big Gigantic is an electronic-jam-band-dance-party. Releasing their latest album, Nocturnal, for free on their website this past January, it's already been downloaded more than 120,000 times. 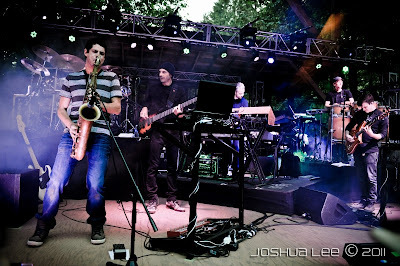 Now, it's time to watch the band flit between keys, sax, laptop, drums, and more on stage. For some super-fresh, female faces out of Portland, must sees include the sultry R&B, hip-hop songstress Reva DeVito and the soulful, R&B electroneer Natasha Kmeto. Check out more of Kmeto's blend of hip-hop, trance and electro here. Plus, another PDX local to peep is dancefloor experimentalist Danny Corn. Get the rest of our picks on OMN. I recently wrote several short business profiles for the NE Broadway Business Association, which were published on their In The Spotlight page. 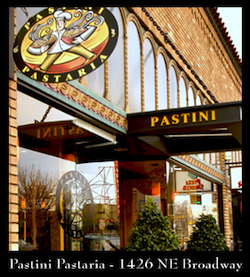 With six Pastini Pastaria restaurants serving up Italian fare from scratch in the Portland area (and eight statewide), co-owner Susan Bashel still remains very fond of the first Pastini, located in the Irvington neighborhood at 1426 NE Broadway St. Opened in 2001 with husband and chef Craig Bashel as well as partners Kara and George Hale, Pastini celebrated its 10th anniversary of the original Broadway eatery this past October. The high ceilings of Broadway trattoria welcome you in to survey the black-and-white photographs of Italia antica—from the fruit vendors and street cafes of Rome to an entire family perched upon a Vespa—or the framed postcards of the Duomo in Florence and drawings of various pasta shapes. And looking forward, Pastini's owners are convinced that those ten years of success and growth were built on community and family as much as sustainability and supporting local businesses like farmers, bakers and coffee roasters. To say thank you, Pastini has always "had a particular interest in supporting our neighborhood schools," Susan Bashel says. "[We] have been a major sponsor of the Irvington School Spaghetti Dinner, by providing pasta and sauce, since we opened on Broadway. For the last two years, we have had a program called Pasta-thon, where we partner with local schools, and sometimes nonprofits, to raise money for them with two day events." Plus, Pastini is sensitive to a family's budget and stays "away from serving more expensive products" while maintaining a variety of choices including vegetarian options and "some fancier dishes like an asparagus salad with arugula and seafood cannelloni, but we’re still keeping the menu to under $12," Susan Bashel insists. 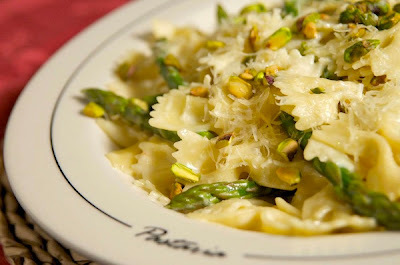 With ongoing promotions like ten lunch specials for under $7 or Sunday three-course suppers for $13.50, Pastini continues to fuel Broadway and Oregon families with fresh, local Italian cuisine. Buon appetito! 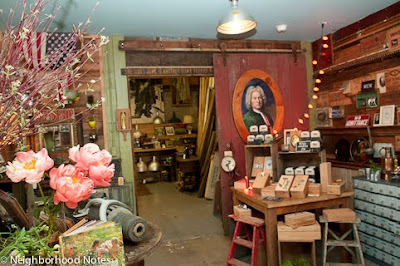 Stepping through the door at Trade Roots is like entering an international marketplace caught in a rare moment of calm. No hustle or bustle, no strange languages or smells, and no sweat dampening your underarms or brow—just Trade Roots' tranquil world of colorful tapestries, women's clothing, jewelry, trinkets, handbags, and quite the selection of scarves will surround you. The family-owned, fair trade boutique now in its 22nd year is run by Tamara Patrick and her niece Katie Keys, and has been located on NE Broadway Street at 1831 for more than 20 of those years. 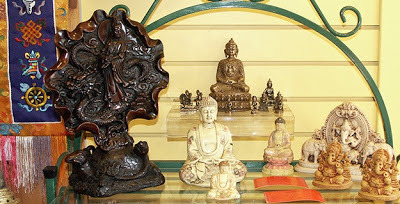 Trade Roots prides itself on the fact this it is "not your ordinary import store." "We try to carry fair trade items so we're not supporting factories and child labor," Patrick emphasizes, "which most import stores do." "A fair trade environment means that craftspeople are paid a living wage, one that allows them to pay for basic needs such as food, shelter and health care for their families," Trade Roots officially states on its website. "Working conditions are also a factor, as is the environmental impact of the merchandise." Sourcing items from all corners of the world via trusted importers, Patrick says the store's most popular items are scarves and a wide variety of jewelry with beautiful pieces coming from locations like Nepal, Thailand, India, Guatemala, Mexico, Indonesia, and even right here at home. Local artists include co-owner Keys' "very wonderful, unusual jewelry," according to Patrick, and also the cards and jewelry of Trade Roots employee Nancy Smith Klos. Other Oregon-based jewelers include Joseph Brinton and Jazzola, plus tiny sculptures from Southern Oregon. Amongst the Indian perfumes, natural soaps, hand-carved soapstone elephants, and wooden wall hangs quoting Gandhi and Buddha, Patrick says her favorite objects in the store right now are little raku—a type of Japanese pottery—dream catchers adorned with gemstones. Plus, Trade Roots is also "one of the few stores that carries interesting hats all year round," Patrick points out. Trade Roots does offer shopping online but you have to place orders by calling the store. "Because we have so many one of a kind things" in small quantities, Patrick explains, it is necessary to speak with someone at the store before purchasing. Another Trade Roots' motto states: "Buying with a conscience doesn't mean that you have to give up on quality or selection." Reiterating this sentiment, Patrick makes sure Trade Roots offers plenty of of options, especially when it comes to jewelry, to fit all budgets. "Our goal is to buy as much fairly traded items as possible and to do ethical importing," Patrick explains. And you can find this bounty lining the vibrant walls of yellow, blue and magenta and resting on shelves below gossamer Tibetan prayer flags. Rows upon rows of compact gold mailboxes line the wall as you enter PostalAnnex+ at 1631 NE Broadway. The shelves are filled with packing supplies, wrapping paper, pens, binders, stickers and more while the hum of photocopiers is heard from the far corner, spitting out page after page of posters, brochures, business cards, and documents. Since September 1999, the husband-and-wife team of Brian and Rebecca Newell have been providing Broadway-area residents with copy and printing services, office supplies, mailboxes, and small-parcel packing and shipping. 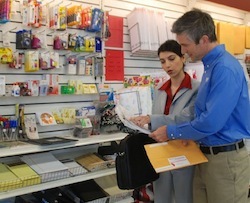 But the owners of PostalAnnex+ recently expanded their services with the addition of Navis Pack & Ship. Occupying another 4,500-square feet in the same building, directly behind PostalAnnex+, the new Navis operation will allow the Newell's to ship large, fragile and expensive packages that were once cost prohibitive to ship because "we had to go through a couple of 'middlemen' to obtain freight shipment services," Rebecca Newell says. "Through a nationwide network of locations and 25 years of experience, Navis provides us with discounted rate agreements directly with the freight carriers for competitive rates and expert training in the specialized packing techniques for this type of shipping. "We are experts in handling equipment, art, furniture, machinery and anything else that is classified as fragile, large, awkward, or valuable, across the country or around the world. Whether a shipment weighs one pound or thousands of pounds, we have the tools and training to crate, palletize, utilize foam-in-place and whatever other materials are needed to get anything to anywhere with care!" Passionate about providing valuable, local services for Broadway neighbors, Rebecca Newell believes her employees make the business stand apart as customers don't have to suffer through tedious, long waits at the post office or the faceless, generic offerings of big box office retailers. Rather, a team of dedicated, invested and qualified professionals will serve you. "Brian and I are fully involved in the business on a daily basis; our manager has been with us 11 years; all our employees are on the staff because of the professionalism and commitment to customer service they have displayed," Rebecca Newell says. 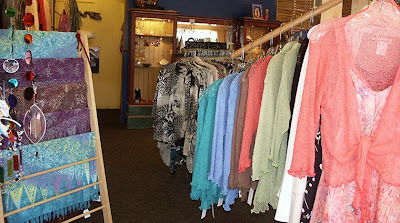 "We are genuinely a locally owned and operated business. Unlike big box stores, we make a concerted effort to buy locally. All of our employees live in North or Northeast Portland." And she's truly appreciative of her customers positively commenting on the "the friendly atmosphere in our store, the music we play, our quick service, and the shipping options we offer, as well as the good pricing on our print services and the personal attention our customers get." Open seven days a week, the Newell's PostalAnnex+ and the new Navis Pack & Ship really do offer "one stop shopping," as many of Rebecca Newell's loyal patrons often tell her. Staying involved in their business and social community, the Newell's also support local public schools by offering discounts or donating print services, as well as maintaining "a food barrel for the Oregon Food Bank, year round, for the past several years," Rebecca Newell says. "Each time the barrel is full we take it to the Oregon Food Bank and also donate $200. To date, we have donated $3,400." From providing office supplies to staying socially involved in the community to shipping anything anywhere, the Broadway PostalAnnex+ and Navis Pack & Ship has the experience and services to meet your needs. This is the fourth article in a series about neighborhood branding, which explores the perceptions of your neighborhood before determining what to change and setting goals. We will now continue with making your neighborhood’s brand come to life. Successful brands are always defined by logos—the combination of a stylized name and image that represents a concept much larger than the sum of its parts. Yet, our modern world is full of too many poorly created, or even unbranded, brands. If you think people have the wrong perception of your neighborhood, it’s not because your neighborhood lacks its own unique identity, but rather, because your neighborhood lacks a cohesive brand identity. The simplest, most easily understandable and recognizable part of your neighborhood’s brand should be a visual identity—your logo—followed by the physical implementation of that logo on street light banners, decals and other signage. Establishing a logo is the first step to making your brand come to life. So, if you’ve done the hard work, which includes taking the time to understand your neighbors and local businesses, as well as your audience, and set realistic, measurable goals, it’s time for some action. Be forewarned, choosing an agreed-upon logo that the community feels is representative of itself is no easy hurdle to overcome. But it’s important to remember that a well-designed, thought out logo is an ideal way to invigorate an intangible idea, the qualities of your community. Create very targeted work that embodies your community. Find concepts that everyone can rally around, such as your neighborhood’s history, and physically define yourself with imagery and typography that represents this. Be sure to consider longevity, or the shelf life of your brand, Heffernan says. Your “branding is going to, hopefully, last a very long time so it has to take a very intelligent, very strategic approach to make it unique but also classic," she says. Make your new physical presence highly visible, Fisher says. Employing a consistent message across “logos, banners, bumper stickers, T-shirts, signage, neighborhood business or walking maps, and other graphic elements may be very effective in introducing and informing the public about the location, history and attributes of a neighborhood,” Fisher explains. “Many individuals have never even heard of some neighborhoods in which residents have enormous personal pride,” Fisher continues. But, increased visibility and effective branding tools can not only educate others but may also “help bolster a neighborhood’s identity and sense of civic pride,” Preston adds. And once you've created your logo, learn about making a style guide on Neighborhood Notes. Portland's annual indie music summer classic is almost here! In just one short week, the ninth annual free, all-ages PDX Pop Now! 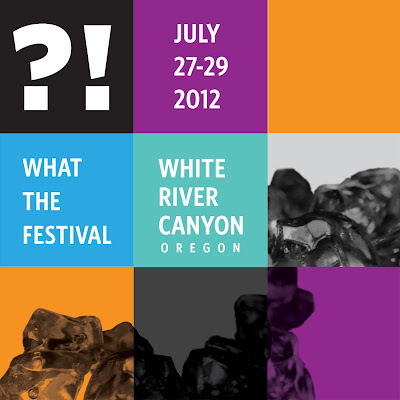 festival will be once again hosted at Refuge from Friday, July 20th through Sunday the 22nd. Now, there's a lot that could be said about each and every one of the 45 acts at that'll be taking the two stages at this year's PDX Pop Now!, but frankly, our time is as precious as yours. Plus, there's a convenient new splash page on the PPN! site that includes nifty little bios written fresh for the fest! If you show up to this weekend's Mississippi Ave Street Fair, you can get a preview of the two acts that'll be kicking off PPN! 2012. And in the true eclectic spirit of PPN!, The Parson Redheads and 1939 Ensemble could not be more appropriately Portland, but each in their very own distinctive ways. With The Parson Redheads you'll get a sweet dose of melodious hippie folk, replete with shakers, harmonica and maybe even some bare feet, plus a pair of authentic gingers to boot. And in archetypal Portland fashion, the PDX via LA band was officially christened earlier this year, appearing on Portlandia as the barber shop quartet during the song "Dream of the 1890s." Representing PRTLND hip-hop on day one will be TxE, which includes the talents of Tope and Epp on vocals and G_Force (aka Calvin Valentine) on beats. The trio released their debut album, We Get It In True, earlier this year, and check out "The First One" below—the first cut from that record. Both AU and Radiation City have been steadily gathering steam as of late. AU's been building up frenetic sparks with a new record, Both Lights, that features none other than bass saxophonist Colin Stetson on the first single "Solid Gold" adding to Luke Wyland and Dana Valatka's off-center energy. To insert some visual color to AU's dazzling compositions, watch the video for "OJ" by Japanese director Takafumi Tsuchiya. Get the rest of our picks for Saturday and Sunday on OMN. It doesn’t take a brilliant mind to realize that burritos and beers go together. And many Portland purveyors of food and beverage have figured out ways to creatively share business spaces. Our first list of examples was concerned with those sharing due natural proximity and complementary offerings: There are the bars that allow cart food, the pizza makers that deliver to bars, and the Mexican restaurant that serves other bars and shares a bathroom with a strip joint. But, another group of inventive Portlanders are thinking about complementary offerings in a different way, breeding strange and even more interesting bedfellows. Have you ever considered how you could share your retail space with other businesses? Could you save considerably on your overhead, whether that’s rent, utilities or even employees? And if you were to enter into such a situation, what kind of agreement should you have in place? Let a few Portland business owners doing just this explain. The owners of three independently owned businesses—Salvage Works, Solabee Flowers and Boys' Fort—affectionately refer to their shared space as The Fort. 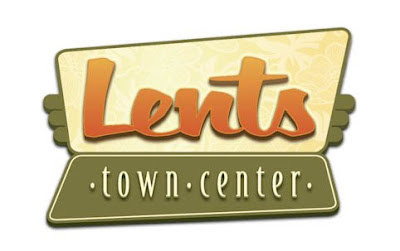 “Each business is an independent entity, but we share one retail space completely seamlessly. So, all three of our stuff is mixed in the room," says Alea Joy of Solabee Flowers. The owners of each individual business have known each other more than a year now and each has collaborated with the others in the past. All three came together because, "We were looking for a place to move, and we all really liked working together, and we all are dedicated to the neighborhood of Kenton," Joy explains. Across town on NW 23rd Avenue, another pair of indie business—one an optical retailer that’s been locally owned for more than a century and the other a team of jewelry designers still in their nascent years—are also gracefully sharing a single retail space. Touting “curated artisan attire,” The Specialty Store came into existence when Sticks & Stones Accessories and the long-standing eyewear professionals Reynolds Optical decided to collaborate, renaming and revamping the offerings of the once optical-only shop to include singular, high-quality items from around the world. Sticks & Stones’ Art Director Marc Ishida says his company has always looked up to Reynolds because of its independence and longevity. “In my opinion, that's a pretty big milestone in this community to have an independently owned business that's been around that long," Ishida says. Each business had a mutual appreciation for the other and saw an opportunity because Reynolds had plenty of extra room in its northwest location. The goal is “to offer something to Portland that you can't get anywhere else, which is why it's called Specialty Store—finding things you can't find anywhere else in Portland or even the West Coast for a lot of these brands,” Ishida explains. Find out more about the benefits of and advice for sharing your business' space on Neighborhood Notes. I designed some swag, t-shirts and flyers for this year's Waterfront Blues Festival. 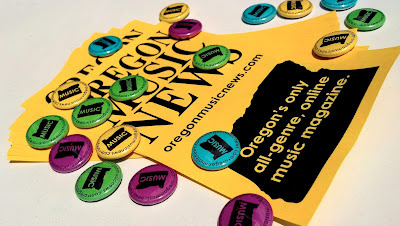 The buttons were a hit—thanks goes to our Publisher Ana Ammann for suggesting. 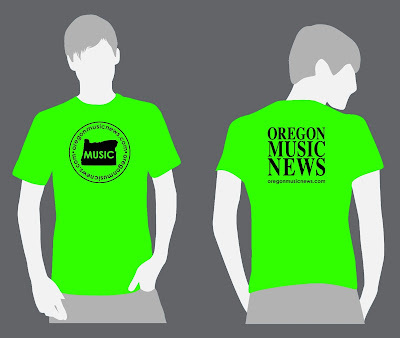 Lots of people asked where they could buy one of our incandescent lime tees so we'll have to print more in the future. For now, look for them at more festivals this summer! It's about this time of year that Pegasus Dream likes to drop a gloriously intricate electronic and psychedelic bomb on Portlanders. Releasing their debut album in August 2010, the duo of JT Lindsey and Andy Carlson is now solidly a trio with the addition of drummer and producer Jeff Bond. And the three are back with a fresh, five-track EP of jams so perfect for the summer nights that'll hopefully soon be upon us. With Bond behind the controls at his studio Clangor Den, the polyphonic layers on In Absentia feel much fuller and richer than the previously home-produced Pegasus Dream efforts. But the distinctive Ratatat-meets-MGMT style of PegDre is still intact with indelible melodies that shift instantaneously after being imprinted upon your brain. And as the falsetto vocals mimic the high-pitched synths, all five songs are ripe with electronic flourishes that are enchanting enough to make you dance whether you're driving with the windows down on a sunny day or listening late into the evening on the porch. In preparation of the new EP's release via SoHiTek Records on July 10th, keyboard player and vocalist Carlson got together with friend and artist Lindell Serrin, who also designed the artwork for Pegasus Dream's debut album Painting Pantheons, to create a subtly interactive website and online experience for In Absentia. "Lindell and I actually collaborated on this project over the span of a few months," Carlson says. 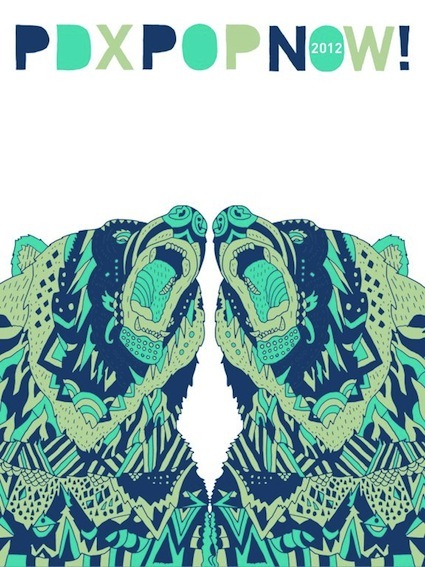 "We wanted the art to reflect the more organic/analog sound of the EP. We spent a lot of time researching and sharing art direction that we liked that we felt would fit our style. We also wanted to make sure the art reflected the more sophisticated nature of the songs." With Serrin crafting simple line vectors that resemble triangular teepees, winking eyes, and tribal-esque patterns, Carlson worked alongside manipulating pixels for print and web, generating vaguely otherworldly photographic illustrations. "The typography and symbols are meant to represent the mythology we feel has always played somewhat of a role in our music," Carlson explains. "I programmed the website and took the photography, while Lindell did the type work the disc print layout. The website and the CD were designed side by side, neither was an afterthought. The website is like a CD in an all-digital form." 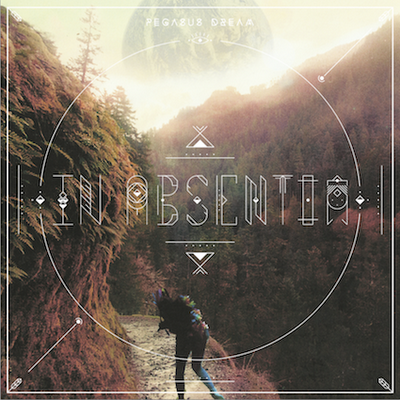 As PegDre looks to celebrate the release of In Absentia with a show at the Doug Fir on Friday, July 13th with Aan and Forest Park, they've planned a few treats for attendees. The band has partnered with a custom bracelet website, Wearshare, to create limited edition In Absentia bracelets. Each canvas bracelet will have a QR code that will link people to a free download of the new EP. Plus, the first 100 people through the Doug Fir's door will also receive a free CD copy of the record.